To stop a pointless argument with your child, you leave the room and get a brown paper bag to put over your head then you walk back into the room. I tried this for the first time last night. It was tea time, he was tired, he was really grouchy and it’s nearly the end of the school term and that’s gotta be getting to him. We started arguing about something so minor I can’t even remember it now but it was just escalating and escalating. It’s really hard to calm down when you’ve got your child just focusing on what their beef with you is at that particular time and won’t be swayed. Add the tired bit in, and it can be very volatile. 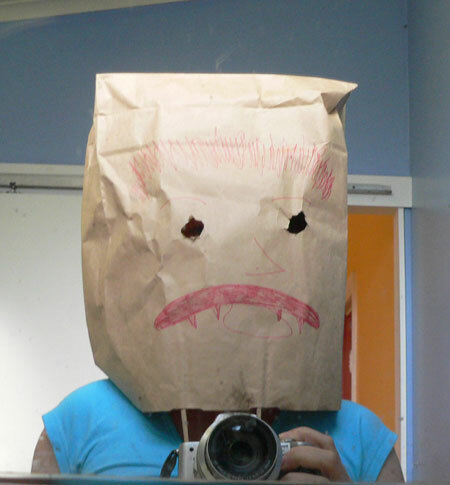 I picked up the paper bag idea from my the woman who massages me. I hadn’t had time to cut holes in it but me walking back into the lounge with my arms out in front hoping like hell I wouldn’t trip over anything made him laugh and it made me laugh and hey presto, pointless argument forgotten. Here’s the famous brown paper bag with some eyes cut out of it and a drawing of an ugly cross face with the tongue poking out. I never said I could draw. Yep, that would do it Jen. That would definitely stop any arguement…pointless or not. I must try that sometime. Hugs to you and JJ. That is hilarious! My 4-year-old is the queen of circle arguing, so maybe this would work! filing that gem away in my parenting rolladex, I’m sure it will come in handy! I love it. I tend to start whispering…will need to try the bag. Excellent idea — shock them into quiet!